Maine has just joined the ever-growing list of states ineligible for the Amazon Associates affiliate program. The retail giant will shortly be terminating affiliate activity in the state, and sending out unpaid earnings to participants, in response to governor Paul LePage’s recent state tax legislation. There has been a growing trend of states passing legislation redefining what constitutes a “local business presence,” widening the definition in order to grab a slice of online sales. States usually require that businesses with a physical presence within their borders collect sales tax from buyers—unless that state does not have a sales tax, in the case of New Hampshire. Out-of-state businesses are not obligated to unless they have a physical presence in the state in question. What the states have been doing is defining members of affiliate programs as a physical presence, so if a Mainer puts Amazon affiliate links on his or her blog, Amazon must collect sales tax for any sales they make to Maine residents. Understandably, this is something online retailers prefer to avoid, as it complicates accounting. Greetings from the Amazon Associates Program. We’re writing from the Amazon Associates Program to notify you that your Associates account will be closed and your Amazon Services LLC Associates Program Operating Agreement will be terminated effective October 6, 2013. This is a direct result of the unconstitutional Maine state tax collection legislation passed by the state legislature and signed by Governor LePage on June 5, 2013, with an effective date of October 9, 2013. As a result, we will no longer pay any advertising fees for customers referred to an Amazon Site after October 6, nor will we accept new applications for the Associates Program from Maine residents. Please be assured that all qualifying advertising fees earned prior to October 7, 2013, will be processed and paid in full in accordance with your regular advertising fee schedule. Based on your account closure date of October 6, 2013, any final payments will be paid by December 31, 2013. While we oppose this unconstitutional state legislation, we strongly support the federal Marketplace Fairness Act now pending before Congress. Congressional legislation is the only way to create a simplified, constitutional framework to resolve interstate sales tax issues and it would allow us to re-open our Associates program to Maine residents. If you’ve ever made a dropdown menu, you’re probably familiar with the “hover delay problem,” where a user tries to diagonally move the mouse from a submenu trigger to the menu that pops out, which causes the menu to snap closed when it loses focus. A common remedy is to add a delay, so the user has time to get their cursor from point A to point B without the menu closing or changing. Unfortunately, this makes menus seem sluggish, as there’s a small (but noticeable) delay before menus open or change. Amazon, however, uses a more advanced trick, which cleverly solves the problem while enabling the menu to be snappy and delay-free. They track the cursor movement to determine the user’s intent. If it’s moving diagonally toward the submenu, the menu stays open. If it’s moving down the list, the submenu instantly changes. No delays making it seem sluggish, and no irritations from glitchy menus. Ben Kamens, lead developer at Khan Academy, described this behavior in an interesting blog post and released a jQuery plugin that replicates it. It seems like a good way to throw up a quick traffic-resistant website, though I imagine it could get expensive pretty quickly if it were, say, submitted to Reddit. I just happened upon an interesting new Labs service from Google: Google Storage for Developers. It’s very much like Amazon S3 in concept, but from Google. It’s a cheap, pay-as-you-go file storage service that could be used for anything from backing up data to hosting podcasts to serving images. Google Storage for Developers will cost $0.17 per gigabyte per month for storage, plus transfer fees. It seems slightly more expensive for the month-to-month fee, but the bandwidth charges might be cheaper. For the duration of the preview Google is offering “100 gigabytes of storage and 300 gigabytes of bandwidth per month” at no cost. It’s also worth noting that Google offers App Engine, a cost-efficient cloud hosting solution for Python/Rails/Java applications. Amazon has a similar service as part of their impressive AWS suite. With either provider, Google or Amazon, you could cheaply run a large web application more efficiently than if you were having to manually deploy physical servers. Reddit awhile ago switched from running their own servers to using AWS and has had nothing but good things to say about it. It’s nice to see some more competition in this area. Hopefully it will lead to lower prices. Arq, by Haystack Software, takes a slightly different approach. It’s designed for those of us who already have Amazon S3 accounts. Arq lets you set a monthly budget, say $5 (which gets you 50GB or storage). The application then keeps the folders you choose mirrored with Amazon S3. It operates on the same hourly schedule as Time Machine, keeping multiple versions of the files. It periodically deletes old versions of the files to stay within the storage space equivalent to the monthly budget you set. It even encrypts your files with a passkey of your choosing. If you’re selective about the data you back up, the pricing should be fairly reasonable. It seems like a good way to back up data. You could use it in tandem with Dropbox; Arq+S3 for backing up your critical data, Dropbox for sharing and collaborating. Amazon S3 is a neat service that allows you to “pay as you go,” and host your files on Amazon’s speedy cloud servers. They charge $0.15 per gigabyte in bandwidth, as well as a monthly $0.15/GB storage fee. I’ve been using Amazon S3 for off-site storage of my server backups for awhile, and it recently occurred to me that would be a great place to host podcast files. If you coupled it with Amazon’s CloudFront service, a CDN that pulls from your S3 account, you could help speed up your subscribers’ downloads. (A CDN, in case you were wondering, is a service that mirrors your files across servers in different geographic locations, to ensure that your users are downloading from a nearby server.) It costs the same $0.15/per gigabyte, minus the silly “thousandth of a cent” HTTP request charges. I wonder how many podcasters are using Amazon Web Services. It seems like a fairly affordable, and certainly reliable, option. In 1997, Amazon filed for the infamous “1-Click Patent,” a “Method and system for placing a purchase order via a communications network” using a single click. The U.S. Patent Office, in 2006, started an inquiry into the questionable nature of the filing. Unfortunately, that has ended. The patent has been confirmed, and is set to expire in 2017. What does this mean for online business? 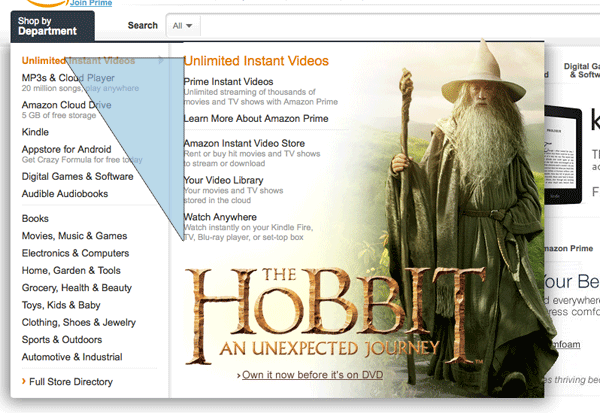 The one-click model is fairly commonplace in online commerce, particularly with services selling entertainment media. If you manage your own web server, as you do with a VPS, one thing you need to look into is a backup strategy. It wouldn’t be pleasant for your files to vanish into the ether in the event of some sort of catastrophic server meltdown, would it? Optimally you want to, on a daily basis, offload a copy of everything important to a separate geographical location. One excellent way to do that is to follow Pro Blog Design’s new tutorial on how to automatically back up your files and databases to Amazon S3. S3, or Simple Storage Service, is Amazon’s cheap cloud data storage system. Michael Martin, the author of the tutorial, says that his bill from last month was $2.60. ($0.15 per month per GB for stored, $0.15 per GB transferred.) Using a backup script on your server, you can automatically archive and encrypt your files and MySQL dumps, then send them off to Amazon’s servers for safekeeping.